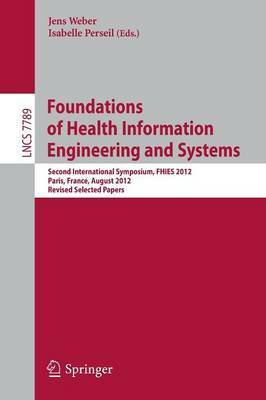 This book constitutes the thoroughly refereed post-conference proceedings of the Second International Symposium on Foundations of Health Information Engineering and Systems, FHIES 2012, held in Paris, France, in August 2012. The 11 revised full papers presented together with 3 short papers in this volume were carefully reviewed and selected from 26 submissions. Topics of interest covered in this volume are such as software engineering; systems engineering; data engineering; applied mathematics; and psychology.